A graphic overview of corporate–academic relationships, and how the balance of output has changed. Corporations are known to protect their property. But when it comes to the production of high-quality research, they see value in collaboration. 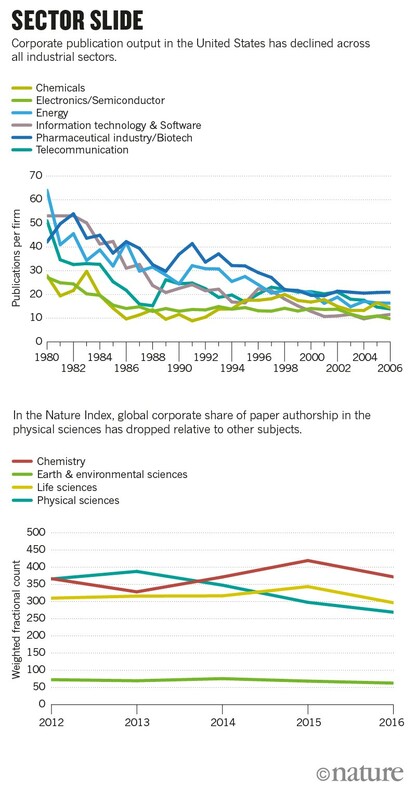 Almost 90% of the articles that corporate institutions author in the Nature Index are in collaboration with researchers in academic or government labs. And most of these collaborations cross national boundaries. The number of partnerships between a corporate and an academic or government institution has more than doubled in the five years since 2012, when the index began tracking high-quality research. From an initial 12,672 pairings, the connections have grown to 25,962 in 2016, half of which were in the life sciences. 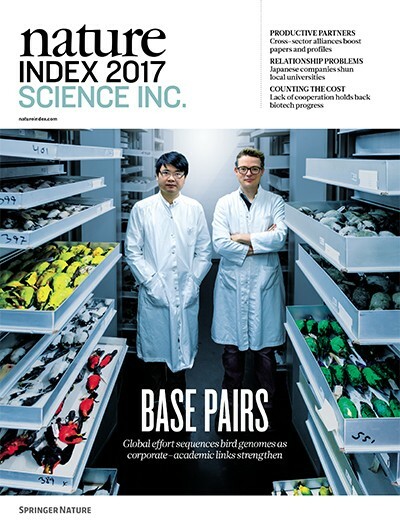 Part of Nature Index: Science Inc.
A firm-level analysis by researchers at Duke University found that in 1980 the average corporation in the United States published 29 papers a year in the Web of Science database and 16 patents. By 2006, the counts had reversed, with the average firm publishing 12 papers and 35 patents annually. The decline in papers is apparent in every industrial sector, from electronics to telecommunications and the pharmaceutical industry. 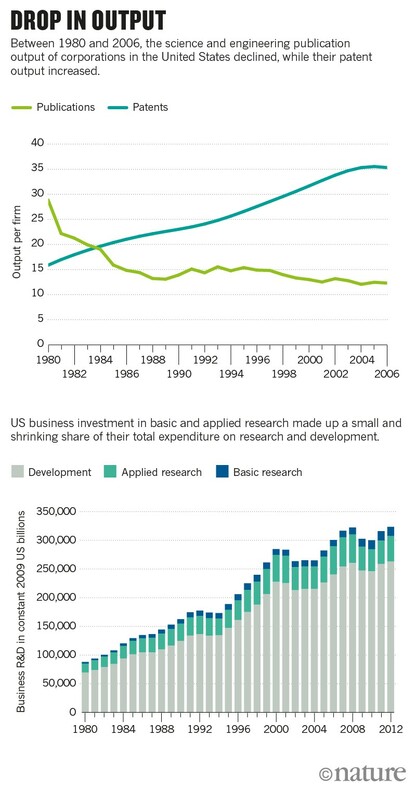 During the same period, the share of US corporate investment in basic and applied research, as a proportion of total research and development, has shrunk from 26% to 22%. While index data tell the story of collaboration, US patent citations show the outsourcing of corporate science. 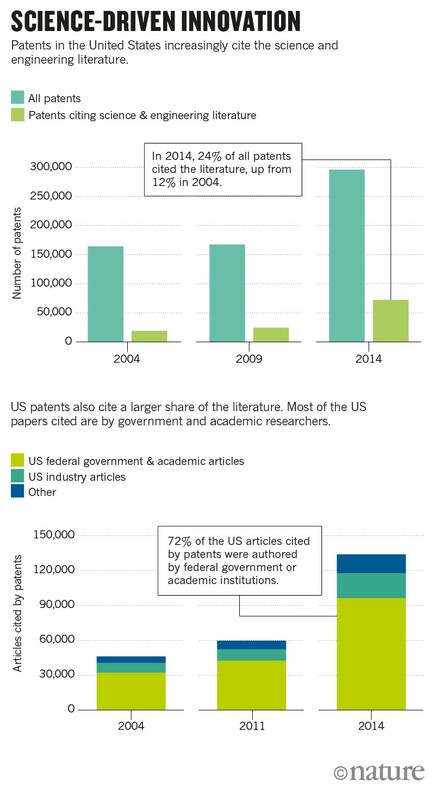 Compared to a decade ago, more patents cite more of the science and engineering literature, but only a small fraction of the cited articles is authored by corporations. 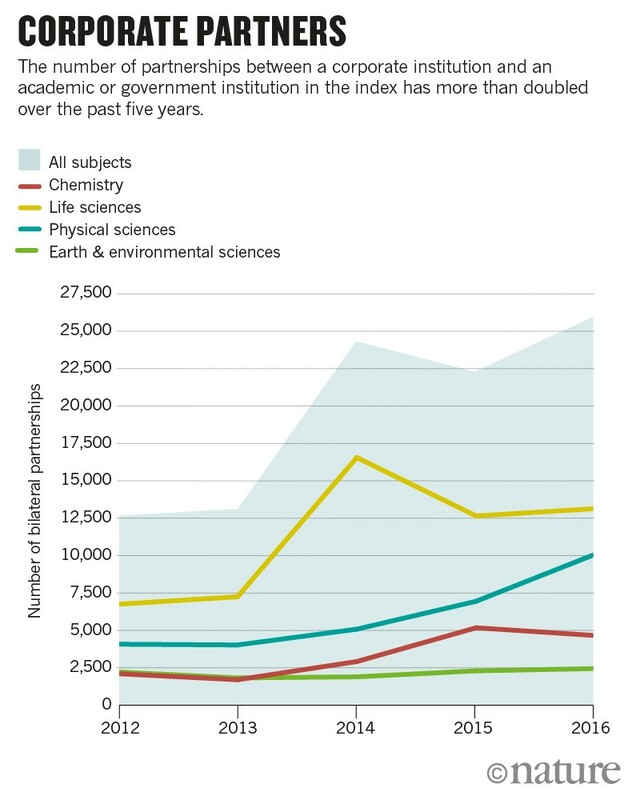 A larger, growing share is produced by academic and government institutions.Overall, corporations contribute to a minor 2% of high-quality research tracked by the Nature Index. On current trends, their contribution could further diminish. Data analysis by Aaron Ballagh, Bo Wu and Willem Slijp of the Nature Index; Sharon Belenzon and Ashish Arora at Duke University; and Andrea Patacconi at the University of East Anglia. 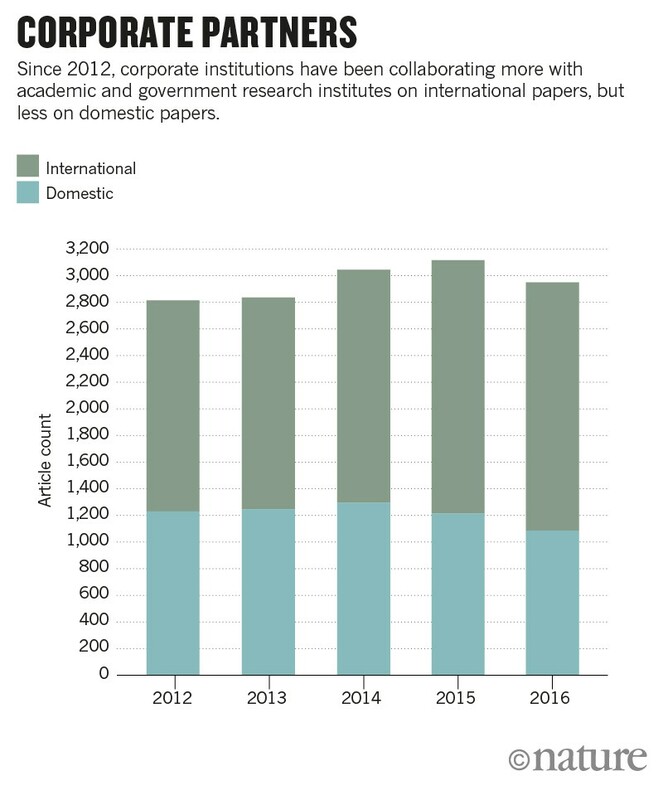 The Nature Index database tracks the affiliations of high-quality natural science articles, and charts publication productivity for institutions and countries. Article count (AC) includes the total number of affiliated articles. Weighted fractional count (WFC) accounts for the relative contribution of each author to an article, and adjusts for the abundance of astronomy and astrophysics papers. More details here.